This article is about the 1974 film. For other uses, see Conversation (disambiguation). 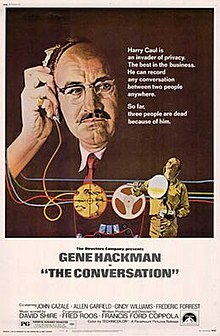 The Conversation is a 1974 American mystery thriller film written, produced and directed by Francis Ford Coppola and starring Gene Hackman with supporting roles by John Cazale, Allen Garfield, Cindy Williams, Frederic Forrest, Harrison Ford, Teri Garr and Robert Duvall. The plot revolves around a surveillance expert and the moral dilemma he faces when his recordings reveal a potential murder. Coppola cited the 1966 film Blowup as a key influence. However, since the film was released to theaters just a few months before Richard Nixon resigned as President, he felt that audiences interpreted the film to be a reaction to the Watergate scandal. The Conversation won the Grand Prix du Festival International du Film, the highest honor at the 1974 Cannes Film Festival. It was nominated for three Academy Awards in 1974 and lost Best Picture to The Godfather Part II, another Francis Ford Coppola film. In 1995, it was selected for preservation in the National Film Registry by the Library of Congress as being "culturally, historically, or aesthetically significant". Harry Caul is a surveillance expert who runs his own company in San Francisco. Caul is obsessed with his own privacy; his apartment is almost bare behind its triple-locked door and burglar alarm, he uses pay phones to make calls, claims to have no home telephone and his office is enclosed in wire mesh in a corner of a much larger warehouse. He has no friends, his mistress Amy knows nothing about him, and his one hobby is playing along to jazz records on a tenor saxophone in the privacy of his apartment. Caul insists that he is not responsible for the actual content of the conversations he records or the use to which his clients put his surveillance activities. However, he is racked by guilt over a past wiretap job which resulted in the murder of three people. This sense of guilt is amplified by his devout Catholicism. Caul, his colleague Stan and some freelance associates have taken on the task of bugging the conversation of a couple as they walk through crowded Union Square in San Francisco, surrounded by a cacophony of background noise. Amid the small-talk, the couple discuss fears that they are being watched, and mention a discreet meeting at a hotel room in a few days. The challenging task of recording this conversation is accomplished by multiple surveillance operatives located in different positions around the square. After Caul has merged and filtered the different tapes, the final result is a sound recording in which the words themselves are crystal clear, but their meaning remains ambiguous. Caul feels increasingly uneasy about what may happen to the couple once the client hears the tape. He plays the tape again and again, gradually refining its accuracy. He concentrates on one key phrase hidden under the sound of a street musician: "He'd kill us if he got the chance." Caul constantly reinterprets the speakers' subtle emphasis on particular words in this phrase, trying to figure out their meaning in the light of what he suspects and subsequently discovers. Caul avoids handing in the tape to the aide of the man who commissioned the surveillance. Afterward, he finds himself under increasing pressure from the client's aide and is himself followed, tricked, and bugged. The tape of the conversation is eventually stolen from him in a moment when his guard is down. He goes to the client to find he has received the tapes, and learns that the woman in the recording is the client's wife, apparently having an affair with the other man in the tapes. Caul books a hotel room next to one mentioned in the recording of the conversation. He uses equipment to overhear the client in a heated argument with his wife. When he goes to the balcony to watch the events through the windows out of curiosity, he sees what appears to be the wife getting murdered and retreats in shock. Caul later attempts to confront the client, but the client is absent. While departing, Caul catches sight of the wife, alive and unharmed, in a limo. He learns that his client was killed in an "accident," and discovers the truth: the couple were talking about killing the woman's husband, and the murder Caul witnessed was actually that of his client and not the wife. Caul gets a phone call from his client's assistant, who tells him not to look any further into the matter, and says, "We'll be listening." Caul goes on a frantic search for a listening device, tearing up his apartment to no avail. He sits amid the wreckage, playing the only thing in his apartment left intact: his saxophone. Coppola has cited Michelangelo Antonioni's Blowup (1966) as a key influence on his conceptualization of the film's themes, such as surveillance versus participation, and perception versus reality. "Francis had seen [it] a year or two before, and had the idea to fuse the concept of Blowup with the world of audio surveillance." On the DVD commentary, Coppola says he was shocked to learn that the film utilized the very same surveillance and wire-tapping equipment that members of the Nixon Administration used to spy on political opponents prior to the Watergate scandal. Coppola has said this is the reason the film gained part of the recognition it has received, but that this is entirely coincidental. Not only was the script for The Conversation completed in the mid-1960s (before the Nixon Administration came to power) but the spying equipment used in the film was discovered through research and the use of technical advisers and not, as many believed, by revelatory newspaper stories about the Watergate break-in. Coppola also noted that filming of The Conversation had been completed several months before the most revelatory Watergate stories broke in the press. Since the film was released to theaters just a few months before Richard Nixon resigned as President, Coppola felt that audiences interpreted the film to be a reaction to both the Watergate scandal and its fall-out. The original cinematographer of The Conversation was Haskell Wexler. Severe creative and personal differences with Coppola led to Wexler's firing shortly after production began and Coppola replaced him with Bill Butler. Wexler's footage on The Conversation was completely reshot, except for the technically complex surveillance scene in Union Square. This would be the first of two Oscar-nominated films where Wexler would be fired and replaced by Butler, the second being One Flew Over the Cuckoo's Nest (1975), where Wexler had similar problems with Miloš Forman. Walter Murch served as the supervising editor and sound designer. Murch had more or less a free hand during the editing process, since Coppola was already working on The Godfather Part II at the time. Coppola noted in the DVD commentary that Hackman had a very difficult time adapting to the Harry Caul character because it was so much unlike himself. Coppola says that Hackman was at the time an outgoing and approachable person who preferred casual clothes, whereas Caul was meant to be a socially awkward loner who wore a rain coat and out-of-style glasses. Coppola said that Hackman's efforts to tap into the character made the actor moody and irritable on-set but otherwise Coppola got along well with his leading man. Coppola also notes on the commentary that Hackman considers this one of his favorite performances. The Conversation features a piano score composed and performed by David Shire. The score was created before the film was shot. On some cues, Shire used musique concrète techniques, taking the taped sounds of the piano and distorting them in different ways to create alternative tonalities to round out the score. The score was released on CD by Intrada Records in 2001. The character of Harry Caul was inspired by surveillance technology expert Martin Kaiser, who also served as a technical consultant on the film. According to Kaiser, the final scene of the film—in which Caul is convinced he is being eavesdropped in his apartment, cannot find the listening device, and consoles himself by playing his saxophone—was inspired by the passive covert listening devices created by Léon Theremin, such as the Great Seal bug. "He couldn't find out where [the bug] was because it was the instrument itself." The film had a $1,600,000 budget and grossed $4,420,000 domestically. According to the review aggregator website Rotten Tomatoes, 98% of critics have given the film a positive review based on 48 reviews, with an average rating of 8.69/10. The site's critics consensus reads, "This tense, paranoid thriller presents Francis Ford Coppola at his finest—and makes some remarkably advanced arguments about technology's role in society that still resonate today." On Metacritic, the film has a weighted average score of 85 out of 100 based on 15 critics, indicating "universal acclaim". Roger Ebert's contemporary review gave The Conversation four out of four stars, and described Hackman's portrayal of Caul as "one of the most affecting and tragic characters in the movies." In 2001, Ebert added The Conversation to his "Great Movies" list, describing Hackman's performance as a "career peak" and writing that the film "comes from another time and place than today's thrillers, which are so often simple-minded." The Conversation won the Grand Prix du Festival International du Film, the highest honor at the 1974 Cannes Film Festival. The film was also nominated for three Academy Awards for 1974, but the Academy preferred Coppola's The Godfather Part II, unlike critics in the National Board of Review and the National Society of Film Critics. According to film critic Kim Newman, the 1998 film Enemy of the State, which also stars Gene Hackman as co-protagonist, could be construed as a "continuation of The Conversation." Hackman's character in Enemy of the State closely resembles Caul: he dons the same translucent raincoat and his workshop is nearly identical to Caul's. Enemy of the State also includes a scene which is highly similar to The Conversation's opening surveillance scene in San Francisco's Union Square. ^ Hilditch, Nick (27 February 2002). "The Conversation (1974)". BBC. Retrieved 11 June 2017. ^ Ondaatje 2002, p. 152. ^ Stafford, Jeff. "The Conversation (1974)". Turner Classic Movies. Retrieved 11 June 2017. ^ Townsend, Sylvia (19 December 2014). "Haskell Wexler and the Making of 'One Flew Over the Cuckoo's Nest'". Retrieved 2 March 2015. ^ Ondaatje 2002, p. 157. ^ "discussion of soundtrack". Archived from the original on 15 January 2002. Retrieved 22 May 2017. ^ "Martin Kaiser". IMDb. Retrieved 22 May 2017. ^ Martin Kaiser; Bob Stokes. "Odyssey of an Eavesdropper". Martykaiser.com. Retrieved 2 September 2017. ^ GBPPR2 (22 September 2011). "The Last HOPE: TSCM - A Brief Primer on Electronic Surveillance and "Bug" Detection (Complete)". Retrieved 22 May 2017 – via YouTube. ^ "The Conversation (1974)". Rotten Tomatoes. Fandango. Retrieved 27 March 2019. ^ "The Conversation Reviews". Metacritic. CBS Interactive. Retrieved 27 March 2019. ^ "The 75 Best Edited Films". Cinemontage - Journal of the Motion Picture Editors Guild. 1 May 2012. Retrieved 13 April 2019. ^ a b "Festival de Cannes: The Conversation". festival-cannes.com. Retrieved 2009-04-26. ^ a b "The 47th Academy Awards (1975) Nominees and Winners". Academy of Motion Picture Arts and Sciences. Retrieved 2 October 2011. ^ Berliner 2010, p. 61. ^ "Film in 1975". British Academy of Film and Television Arts. Retrieved 11 June 2017. ^ "DGA Awards History". Directors Guild of America. Retrieved 11 June 2017. ^ "Conversation, The". Hollywood Foreign Press Association. Retrieved 11 June 2017. ^ "1974 Award Winners". National Board of Review. Retrieved 11 June 2017. ^ "Past Awards". National Society of Film Critics. Retrieved 11 June 2017. ^ Pramaggiore & Wallis 2005, p. 283. Berliner, Todd (2010). Hollywood Incoherent: Narration in Seventies Cinema. Austin: University of Texas Press. ISBN 0292739540. Ondaatje, Michael (2002). The Conversations: Walter Murch and the Art of Editing Film. London: Bloomsbury Publishing. Pramaggiore, Maria T.; Wallis, Tom (2005). Film: A Critical Introduction. London: Laurence King Publishing. ISBN 1856694429. Retrieved 22 May 2017 – via Google Books. This page was last edited on 13 April 2019, at 23:09 (UTC).